I miss this favorite spot already at The Boutique. We stayed here for two nights from Dec 30th till the eve of New Year. I would like to share it as my favorites and share with you my Awesome The Boutique experience. The Boutique have only seven rooms with unique features to consider: 6 rooms have Taal Lake view and 4 rooms are located on the second floor. Privacy is very important since the intent is never to leave your room until check out time. The best rooms are the I Love room located in the ground floor with a lovely patio (shown above); the I Lust room where you have a separate bath tub and the most secluded room; and the I Dream room, also located in the second floor but has the best view of Taal lake. (We stayed in the first two rooms and see pictures below). There is a Hawaiian Bar-B-Que restaurant as the centerpiece of The Boutique and it could get quite noisy during lunch and dinner. Beside the restaurant is the I Love and I Surrender rooms so avoid these rooms if you really need utmost privacy. The I Escape room is the only room with no view of anything. Since the intent is to just stay cozy in your room, I Escape room is a good option to literally escape from the outside world. The I Dare and I Desire room is located in the middle between I Lust and I Dream. This will mean that you have neighbors on both sides of the wall but no worries since the wall has very good sound proofing. I Dream has the best unobstructed view of Taal lake. Below are some of the detailed information about The Boutique. I’ll also walk you through some of the highlights of The Boutique experience below. The Boutique experience starts by selecting a personalized Pamper me body essentials that you will use during your stay. My wife chose Milk and Honey Shampoo and Conditioner and she was happy with its effect on her hair. Since I work for a Beauty company that sells shampoo and conditioner, we had a bit of a discussion about this. My wife made the right choice on the Grape Room Scent. It was amazing to see how scent can influence your emotions. I love the Peppermint and Tea Tree Soap because of the minty effect on your skin. Although it kinda smell like a Perla soap when you really smell the soap and it is brittle after its first use because of the thinly sliced soap. After selecting your Pamper Me flavors, you head to your room never to be seen again. Choosing the right room is crucial. This is located in the first floor on the left side of the Hawaiian Bar-B-Que restaurant. If you want real privacy, there is a curtain outside by the patio to serve as your gate but then, you won’t be able to breathe in fresh cool air of Tagaytay. While we were there, there were people who were interested to see the rooms so they sorta walk by the patio and look around. Another tip is to always lock your door because this leads to the main lobby of The Boutique. We had two experience where guests accidentally opened our door. We were not sure whether they thought it was their room or mistakenly thought it was the rest room. The King size bed can fit three people and it is a pleasure sleeping in this bed. The pillows add to the drama and the seduction of the entire room. In the patio of the I Love room, you can find this chair which is the best spot in The Boutique (at least for my wife for it provided warmth that night we stayed :). This is the hallway of mirrors in the second floor of The Boutique. The I Lust room is located at the end of the hallway; this is the most expensive room in The Boutique. The King size bed awaits you with its army of pillows. The most striking thing you’ll see is the separate bath tub overlooking taal lake. Dare to take a shower? If you are shy, there is a cloth cover you can use for the bottom half of the glass window. 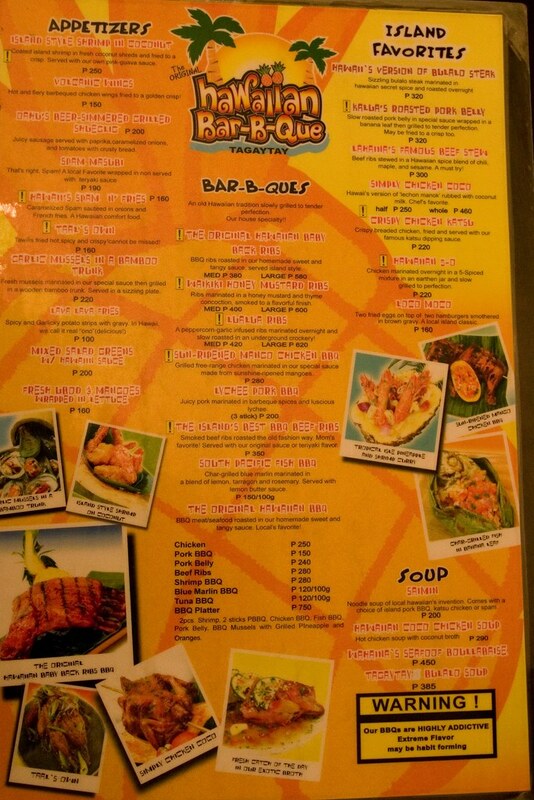 This is the second Hawaiian Bar-B-Que restaurant after the original Boracay branch. I recommend the Baby Back Ribs and the Seafood Boullabaise but better to eat it immediately especially when it is the cold season. Breakfast in bed is your typical filipino breakfast or american style breakfast. 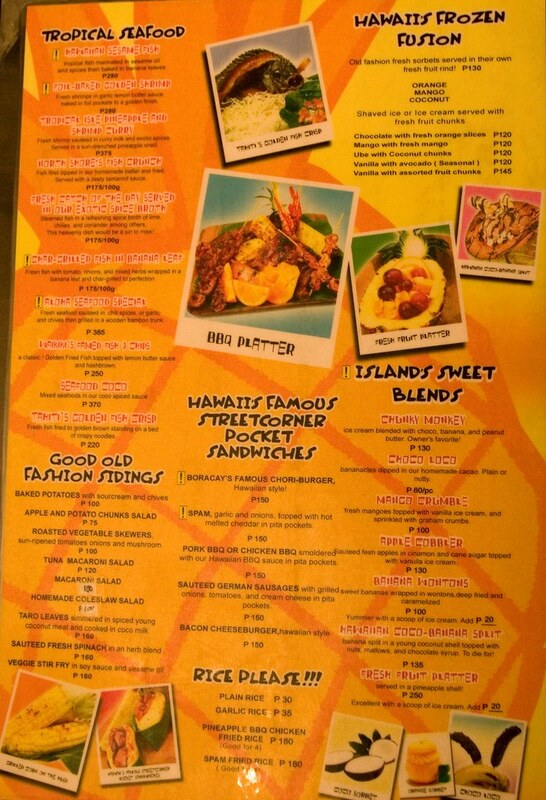 Alternatively, they have a Hawaiian breakfast which is omelet and meat sidings. Of course, we can’t leave Aidan behind and he also want to experience famous The Boutique Breakfast in Bed. hmmm pretty expensive but looks like its worth it 🙂 can’t wait to check this place out! once again, thanks anton! i was wondering — because u mentioned that for the “I Lust” room, there’s a separate bath…for the other rooms, there’s no bathroom inside the room? thanks again. i am thinking of booking that for our anniversary…but october pa…i hope by then they have lean season rates. hehehehe. I would just like to ask if you are open or would like to have a tie-up with travel agencies? I hope to hear from you the soonest! I am sooooo excited to try this place out! I booked for February 17 – 18, and good thing too because they only had 3 rooms left! I booked the “I Surrender” room because the “I Love” was already booked. P.S. my team and I are still avid readers of your blog.Ü We have influenced more people. hehehe. lurker here of your famous blog. this one is very nice, pricey but i guess it’s worth it. i love this.. i want to go here someday, when my budget permits me! hehehe.. it’s expensive but i think it is worth the experience! Wow, great discovery Anton! I look forward to escapades with my ex-bf now hubby here…Thanks. BTW, i put a link of your blog in my own blog. Just to share with my visitors. Cheers to more food and place discoveries! Fine architecture simple yet elegant…. Blended with awesome panoramic view of Taal lake…. Definitely, I’ll go back and try the other rooms!! Stayed recently here in “I Surrender” — was nice to escape for a night but very disappointed considering the price tag. Toilet broke — shower nozzle came off in my hands when I turned it on — lots of noise from restaurant on one side and kitchen from the other side — people walked in thinking our room was the restroom. In addition, the finishing touches on this place was poor. exposed electrical wires jutting from the patio floor, very poor tiling work in the bathroom, cheap xeroxed forms for breakfast. Superficially, everything about this place looked nice. But if you looked close, there were problems everywhere. Its as if the owners had no real idea about developing (and maintaining!!) a quiet B&B for those who want to escape. are the rates per night? thanks! ive been there! awesome place! hi anton! i love your blog about this place! we have booked na sa i desire room.. sa i dream sna kaso its booked na 🙂 btw, if u dont mind, may i ask wat camera are u using? we stayed in the “i dare” room, we were greeted with rose petals and candles throughout the room.The bed is covered in pillows and at its foot lies a large flat screen inviting you to curl up in bed with a hot chocolate,movies and your special someone. Its really a romantic getaway for couples..would love to go back and try other rooms. LCD TV’s are good, but I prefer plasma. The picture quality is superior and the unit’s seem to last longer. Plus they look cool.